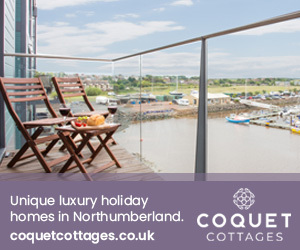 This 135-mile walk, from the twin sources of the Tyne to the North Sea, reveals the wonderful variety of terrain and scenery in Northumberland, as it passes through sparsely populated landscapes, forests, farmland, delightful villages and hamlets with their castles, churches and traditional pubs. It encompasses Northern Europe’s largest man-made lake, vestiges of Roman, early Christian heritage and railway history as well as the regeneration and transformation of one of the world’s most foremost shipbuilding regions. The idea for this walk, from the sources of the Tyne to where the river reaches the sea, was the brainchild of Brian Burnie. Former businessman Brian Burnie is the founder of the charity, Daft as a Brush Cancer Patient Care. The charity provides free transport for cancer out-patients to and from the Freeman/RVI Hospitals. He believed that such a walk would generate interest in the charity and have particular relevance for people affected, in one way or another, by cancer. 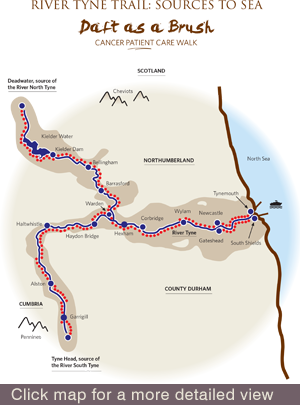 In March 2012, Brian, together with three friends, carried out the original pilot walk from each of the two sources of the River Tyne to the sea at Tynemouth and South Shields. In October 2013 a Chinook helicopter from RAF Odiham lowered two four-metre-high stones, weighing 5 tonnes each, to establish an obelisk marking the source of the North Tyne at Deadwater Farm close to the border between Northumberland and Scotland. 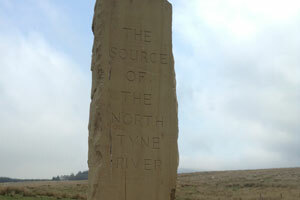 The source of the South Tyne at Tyne Head in Cumbria already had a similar monument. In 2016, marker stones were erected at the finishes of the walk at both Tynemouth and South Shields. The guide book, written by Peter Donaghy and John Laidler, published in 2015 by Sigma Press, contains clear, easy to follow and comprehensive directions. The walk is divided into twelve stages of approximately the same length, based on ease of access, with additional entry and exit points. This enables walkers to create their own itinerary, thus serving both long-distance walkers and day-walkers. The book, in a convenient pocket-size format, contains outline maps for each stage together with extracts from the relevant OS maps. It is beautifully illustrated and contains abundant background information of interest also to “armchair walkers”. The walk is to be officially launched on Tuesday 19 April 2016 by groups of walkers setting out from the two starts and two finishes and walking for 3½ days to converge at The Meeting of the Waters, near Warden on Friday 22 April 2016.